With Renault ZOE, a new automotive era has begun. Tomorrow’s technology taking care of you and the environment you live in today. Rediscover the pleasure of motoring every morning: driving is a relaxed experience. A car that is clean on the outside and clean on the inside; one that you can communicate with remotely. No more queuing at petrol stations, you just have to plug it in. You save time and effort. 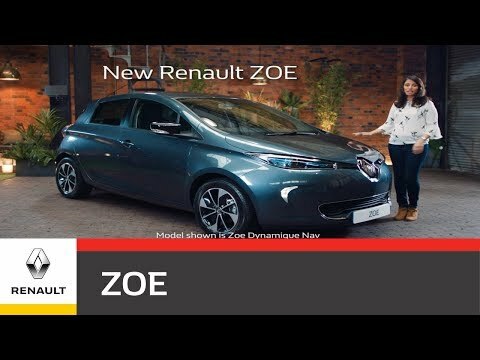 The latest Renault ZOE with the new Z.E. 40 battery sets a new milestone in the market of affordable electric vehicles. The fully electric vehicle offers a 250 mile NEDC range^ and real life estimates of up to 186 miles in summer and 124 miles in winter on one single charge, truly revolutionary! The Renault ZOE with its new Z.E. 40 battery is here for everyone who wants to go further, with ground breaking 250 miles NEDC*range on one charge with real life estimates of up to 186 miles in summer and 124 miles in winter^^. With the new Z.E. 40 battery Renault has proven its expertise and experience in electric vehicle innovation, offering you a greater driving range and full flexibility. With a free Wall-Box included with every ZOE retail purchase, recharging is a no-brainer. Just put your ZOE on the charge like you do your smartphone, and wake up to a fully recharged car that is ready to go. SIMPLE! The charger’s 7kW capacity means that you can charge your ZOE completely, from flat-to-full in 7-8 hours. Where can I charge my ZOE? Discover Renault's electric identity, embodied by the ZOE: blue-tinted chrome diamond on a wide, black radiator grille, streamlined blue-tinted headlamps and two light dimples for the LED daytime running lights. The driver's headrest sports the logo inspired by electric trains, together with the Z.E. signature, which stands for Zero Emission. The Renault ZOE is built from ground-up with the world firsts in technology, making every trip with ZOE rewarding and exciting. Enjoy both comfort and peace of mind with the Renault ZOE. Enjoy real driving pleasure with clean air, silence, automatic gear box and ideal temperature, plenty of features to make driving easier. ^Homologated range according to NEDC test cycle, for comparison purposes, 250 miles, and may not reflect real life driving results. Range will vary on various factors including driving conditions, driving style, temperature and topography but is likely to be between 124 miles in winter conditions and 186 miles in temperate conditions with the Z.E. 40 battery. ^^Homologated range according to NEDC test cycle, for comparison purposes, 250 miles, and may not reflect real life driving results.